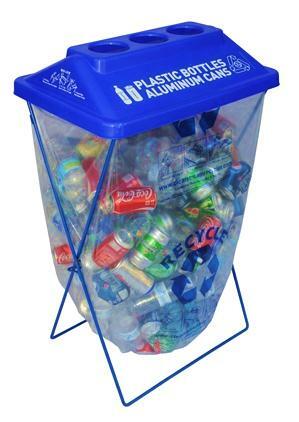 How Do I Obtain Recycling Containers? This menu is for the Environmental Management Department. Use the left side menu to access the main menu for CharlestonCounty.org. Special events generate a significant amount of waste within a short timeframe. Charleston County Government's Environmental Management Department has designed a program to effectively implement recycling at your event. Charleston County offers the use of ClearStream recycling bins for the collection of recyclables and food waste at special events. The County will loan the bins to community groups, nonprofit organizations, businesses and citizens who plan to collect recyclables and food waste generated at events held within Charleston County. The Special Event Recycling Program provides equipment for onsite collection of materials, but does not include the removal of materials after an event for processing. There is no charge to use the equipment, but there is a requirement that the equipment be returned in the same condition (refundable deposit details listed below). The program ensures that waste generated during your event will be diverted from the Bees Ferry Landfill and will be recycled. The number of attendees at an event affects the amount of waste generated. The table below is a helpful guide that can be used to estimate the number of special event bins you will need to collect recyclable materials. To ensure bins are available for your event, contact Charleston County's Environmental Management Department at (843)720-7111 at least 30 days prior to the event to reserve your bins. Up to 15 bins are available at any given time. Note: Charleston County Government does not collect garbage. Your event organizer will need to make arrangements for the removal and disposal of any garbage generated at the event. Charleston County's Environmental Management Department offers special event bins for collecting organic materials that can be turned into compost. These bins are green and are labeled "compostables." For smaller events generating a limited amount of food waste, the County encourages self-hauling of the material from the event site to the Bees Ferry Compost Facility. For larger events, you can contact a private food waste hauler to transport your organic material. If you intend to collect food waste at your event, contact Charleston County's Environmental Management Department at least two months prior to the event date to coordinate a successful plan to keep the waste out of the landfill and put to good use as compost. Bagged recyclable material, excluding food waste, may be dropped off at any Charleston County recycling dropsite location or convenience center. To determine how much recyclable material your event generated, bring your recyclables back to the Recycling Center at 13 Romney Street. Staff can weigh the recyclables for you, which can help set recycling goals for your future events. The cash or check deposit is due when the bins are picked up. Make checks payable to: Charleston County Treasurer. Charleston County reserves the right to keep all or a portion of the deposit if the bins are not returned within two business days following your event. Charleston County reserves the right to keep all or a portion of the deposit if the bins are not returned in the same condition in which they were received (clean and undamaged). Containers must be cleaned before they are returned. 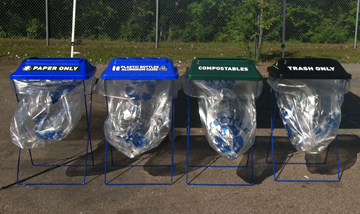 Convenience - To encourage event guests to recycle, place recycling bins next to garbage cans. To help prevent special event bins from overflowing, consider the flow of traffic when determining where to place bins. Communication - Station volunteers where the special event bins are located to assist attendees with separating items into the right container. Consistency - Create consistent educational signage and post it in appropriate areas throughout the event. Signage that includes photos of the actual materials used at the event typically encourage greater recycling participation.